It's time to start featuring the books from Book Swap #6! Ali, also known as Jellygnite, has participated in every swap so far. And here is her most recent contribution. This is a large stab bound book. 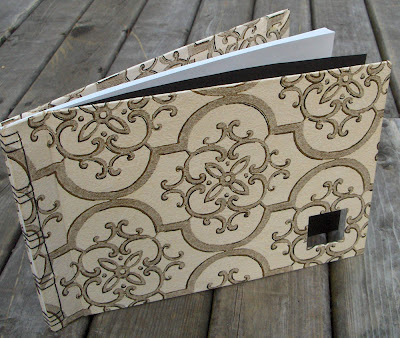 It is a hardcover album-style book, covered with some nifty vintage 1940s wallpaper. She has added a little window in the cover to peak through to the first page. Visit Jellygnite.Etsy.com if you want to see more of Ali's work. See all the books from Book Swap #6. A beautiful book. I like the wallpaper cover; it fits so well in the overall design with the little window. 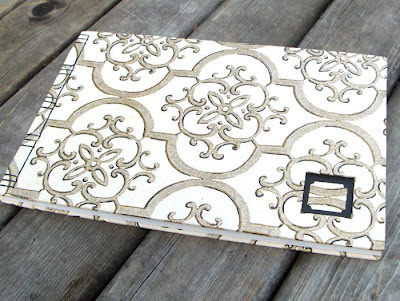 lovely book..I am always fighting with the problem of ornamentation or other types of decoration as it will add to the time necessary to finish the book..then keep it within a certain price..my books are simple but I still think it takes too long to make! Other than making a perfect binding I feel like I am losing $..it is a creative outlet but feel hampered when I think of the sales aspect..
it's mine, it's all mine, bwahhhaa! it's so pretty ali! i love the feel of the paper! I like the unconventional use of wallpaper for the covers--brilliant, and quite lovely!